Quite simply we are the product of our habits. What you repeat is what you become. If the goal is to live mindfully, and it is, than all we have to do is change our habits. By doing this we become aware of our habits and we live in a mindful state. Let’s start by defining MINDFULNESS. It is all the rage and if you haven’t heard of it you are sleepwalking through life. Wake up and know – you want to live mindfully. It is the root of happiness. 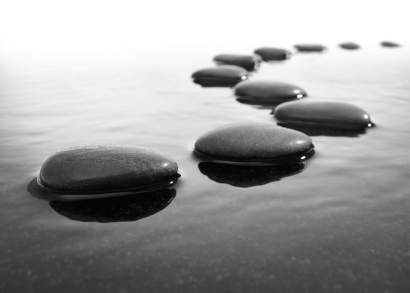 Mindfulness is quite simple, "The state or quality of being mindful or aware of something". It’s secular Buddhism. So all I’m saying is that to become aware, just do something different. Start with the little things. Start by observing what your habit is. Say you notice you always put both socks on, and then your shoes. Try putting one sock and one shoe, then the second sock and second shoe. I guarantee it will blow your mind. Suddenly the world is all about putting socks on. This moment you are aware, you are in the present. And that is the goal. I recently got a little RSI (Repetitive Strain Injury) at work. I have a job where I ship aromatherapy products. I do a lot of wrapping jars in bubble wrap. My right hand had starting aching. So I thought I’ll give it a rest and do more with my left hand. I tried it and suddenly I was a bumbling idiot. I couldn’t do anything. I tried my best, but I just couldn’t. I was totally aware of everything I was doing. I became totally aware of how right hand dominate I am. I had no idea I did so much. So many movements that I had done without thinking about it. Now I was tossed into a state of mindfulness by trying to be left handed. All the things I’d done before without thought, were now stunningly glaring me in the face. All the things I did unconsciously were now awake. Well I kept with it and gradually my left hand start to smarten up. Slowing I began to be able to do things with my left hand. I reasoned that I could type with my left hand so I should be able to do other things. All I had to do was change my habit. I reasoned correctly, because I now have movements that my left hand is the go-to hand. It is the habit. My work rituals have settled down now, I’m moving back into doing things automatically and I am doing the job with both hands. And now I have no pain. I changed up my habits and during the process I was in a pleasant state of mindfulness. Being in a state of mindfulness is, for me, always a happy place to be. And if throughout my day I have moments of happiness I can tie them all together and I am happy. I love watching myself do things. I love being in the present moment. If we are the culmination of our habits, and we can change our habits, and that makes us happy… why don’t we chose better habits to aid our well-being? When we change our habits, lets chose better ones. So that’s today’s advice. Try something differently. Not different, but differently. The stuff you are already doing, just change it up. Become aware of it and happily be present. Go on, try it now. Now is the goal.